"World Class Athletes Sharing a World Class Message"
Faith Force is a team of world-class athletes who use feats of strength to convey a world-class message. Our athletes come from various backgrounds including: martial artists, bodybuilders, power-lifters, football players, world's strongest man competitors, law enforcement officers, soldiers and even "American Gladiators". The athletes perform amazing and exciting feats of strength, including some only seen at Faith Force crusades, in order to draw massive crowds of unchurched people. Faith Force, however, is not a bodybuilding team, they are a faith building team. "Once you get their attention, you go for their hearts." 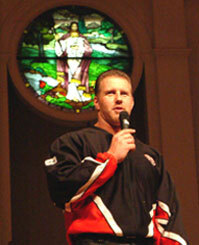 Throughout the crusade, athletes, who are also preachers of the gospel, share powerful messages of faith and hope, as well as testimonies of God's faithfulness and power in their lives. This is followed by an invitation to make a life-changing decision to follow Christ and experience the power in a life of faith. This was Jesus' final instruction to His disciples and to us today. He clearly had a global impact in mind. But spreading Christ's message involves more than just broadcasting a statement or set of facts. It takes faith. "The just shall live by faith." The gospel is powerful enough to transform lives and impact the world! Our heart is to see this happen in every one of our crusades. We know that feats of strength will never change anyone's life, but the message of Jesus Christ can. However, feats of strength can be a very effective tool used to attract the attention of thousands of lost people throughout your community. Many of which might never go to a regular church service. Again, "once you get their attention, you go for their hearts." Intertwined with the incredible feats of strength performed, are powerful and relevant messages. "What does tearing down huge walls of concrete and ice have to do with sharing the gospel? ", some ask. The bible tells us in Ephesians that Jesus is our peace and that He has torn down the wall between us and God. Praise Jesus! He still tears down walls today: walls of racism, walls of unforgiveness, walls of drugs and alcohol, and many other walls of sin that separate us from a loving relationship with God. God has blessed our team with a ministry that is focused on seeing people give their hearts to Him. We want to join hands with you and see faith impact your community. No matter what size your church is, Faith Force is dedicated to helping you reach your evangelistic goals. For more information on bring Faith Force to your church or event, call (336) 229-7331, or complete our contact form and we will promptly reply. Faith Force desires to follow Christ's command, "to go" and His example of serving others. Our mission is to be an instrument of Christ used in winning the lost, building the local church and encouraging its leaders. faith force - a body of men whose belief and trust in and loyalty to God gives them the power and strength needed for effective action and the ability to change the world.